Yesterday afternoon I stopped by at the Bishopsgate Institute near Spitalfields to visit the exhibition marking the 25th anniversary of the Wapping Dispute, made all the more interesting for having a long chat there with John Bailey, a former print worker and and NGA chapel father at The Sun. John very kindly suggested that I couldn't possibly be old enough to remember the strike, but it began on 24 January 1986, the year before I started a degree at City of London Polytechnic in Aldgate. Indeed, I still have old copies of flyers and "Don't Buy The Sun" stickers buried in a trunk in my flat, many of which are included in an exhibition that quite deliberately sets out to provide a workers' perspective on the strike. I also remember the staggering police violence against print workers and protesters, which having probably had more impact on me as an 18-year-old than the Miners' Strike a couple of years earlier. 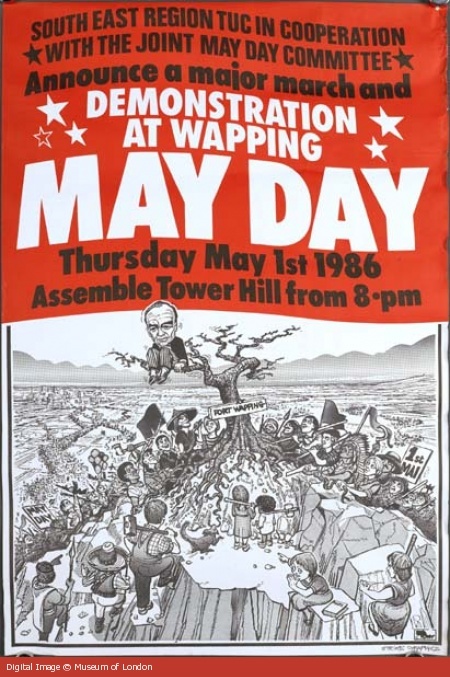 Equally, having pitched up in Tower Hamlets in 1987, the legacy of the dispute, its effect on local communities in Wapping and the defeat of the print unions was a prominent part of the political background of my first year at college. The other legacies of the strike have become clear: removing trade unions from Wapping gave Rupert Murdoch the absolute power to ensure that his journalists did whatever was necessary in the pursuit of greater profit - even when, as we've seen with the phone hacking scandal, the methods used were illegal. It also cemented a cosy and corrupting relationship between News International, the government and the Metropolitan Police that has continued for 25 years, one that only now is the Leveson Inquiry beginning to pick apart.